‘NEW WARS’ IN CONTEMPORARY CHINA? Kunal Mukherjee believes that Mary Kaldor’s New Wars concept has considerable explanatory power, particularly in the case of China’s contested borderlands in Xinjiang and Tibet. These restive areas, after all, are marred by New War realities such as secessionism, vulnerable state authority, pronounced identity politics, the heavy presence of military and paramilitary forces, and much more…. The post Cold War period has witnessed the rise of a new group of conflicts, which well known academics such as Mary Kaldor has called ‘New Wars’1 to differentiate the current group of conflicts from earlier wars that are in keeping with the classical definition of warfare. Kaldor’s thesis, although originally formulated in an East European context at an earlier period, has considerable explanatory power and it is without doubt that the theory still travels far and wide. Scholars have had a tendency to use the ‘New War’ argument within the context of Eastern Europe, the Middle East and Sub-Saharan Africa. It is the aim of this article to go beyond these conventional case studies and use the ‘New War’ theory to understand conflicts in different parts of contemporary China, and to see to what extent this ‘New War’ theory fits in with the Chinese context and helps us to understand those conflicts. 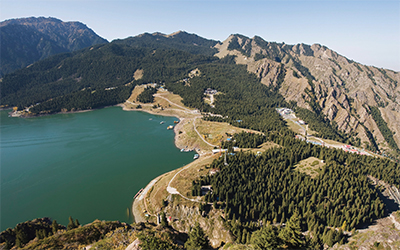 Thus, this article introduces a new set of case studies: Xinjiang and Tibet. Conflicts that are classified as ‘new’ or ‘post-Cold War’ are not really ‘post-Cold War/post-1990s’ in the strict sense of the term, since there are always short term factors and long term factors that lead to the outbreak of a conflict, and some of the long term factors can actually be traced back to pre-Cold War, or even earlier times. Thus, the case studies chosen for this article are ‘new’ or ‘post Cold War’ conflicts in the sense that the levels of violence in some cases have escalated more than ever in the post-1990s phase, although the long term causes can be traced back to earlier times. In Tibet, for instance, we saw a huge uprising that took place in the year 2008. In relation to Xinjiang, Dr. Michael Clarke, a China expert and an Associate Professor of Political Science and International Relations at the National Security College, ANU College of Asia and the Pacific, writes, ‘China became more concerned regarding the security of Xinjiang with the collapse of the Soviet Union in 1991.’2Furthermore, these conflicts have gone on to acquire the characteristic features of what Kaldor calls ‘New Wars’. This article is not so much interested in looking at the intricate details of the individual conflicts, but to what extent does the Kaldor thesis fit in within the Asian context. In this article, I have placed an emphasis on China’s contested borderland regions, Xinjiang and Tibet. Also, I have chosen China as my chief case study because it is one of the two new rising economic giants on the Asiatic mainland, the other one being India. After the Asian Tiger economies reached near industrialised/miracle status, much attention has shifted to the mainland of Asia, with a special focus on China. In a world of increasing interconnectedness, developments in a rising Asia will invariably affect our lives in the west in one way or another. Thus, in an era of globalisation, the problems in Inner Asia or what may seem to be a remote part of Asia could have a profound impact upon our lives in the western world. Image ID C2275R © WENN Ltd / Alamy Stock Photo. 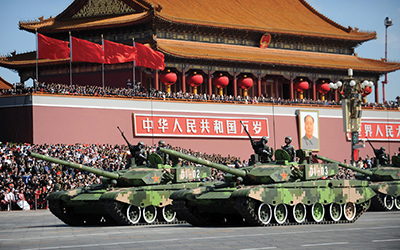 Main battle tanks of the Chinese People’s Liberation Army on parade in Tian’anmen Square, Beijing. Kaldor’s New War theory is most certainly a powerful argument, and it travels far and wide to explain most present day conflicts, including some of the conflicts in inner Asia. The early chapters of the book, ‘Old and New Wars,’ look at some of the characteristic features of what Kaldor calls ‘New Wars.’ ‘New Wars,’ according to Kaldor, refer to those conflicts that started to take place in the 1990s and to a new form of political violence which must be distinguished from old wars. In these new wars, she argues, it has become difficult to differentiate between the ‘global’ and the ‘local,’ the ‘political’ and the ‘non-political,’ acts of aggression, or external attacks and acts of repression, or internal attacks. These wars need to be understood and analysed within the broader framework of globalisation. Kaldor argues, “New Wars are the wars of the era of globalisation.”3 We notice pronounced identity politics in these wars and the participation of the diaspora, or dispersed persons. The presence of the armed forces and paramilitary is also strong in these new wars. We see that these new group of wars are funded differently from the way older wars were funded. For example, the diaspora might provide these conflicts with the necessary funding. In earlier times, wars tended to be funded through state revenue. In these conflicts, we see the presence of both ‘global’ and ‘local’ actors. The ‘global’ refers to UN peacekeeping missions, humanitarian or liberal intervention, the presence of international NGOs, and the presence of the specialised agencies of the United Nations. The ‘local’ refers to indigenous actors, such as war lords, local political actors, Islamists, and so on. These are some of the characteristic features of what Kaldor calls ‘New Wars.’ Kaldor also talks about the sharp economic divide between ‘the global’ and ‘the local.’ These ‘New War’ conflict zones are also prone to human rights abuses. ‘New Wars involve a blurring of the distinctions between war, organised crime, and large scale violations of human rights. Although these wars are localised, they involve myriad transnational connections. New wars also arise in the context of the erosion of state autonomy, in other words, disintegration of the state. New wars occur in situations in which state revenues decline because of the decline of the economy and polity and also amidst criminality, corruption, and the inefficiency of failed or collapsed states. Let us now see how this thesis fits in with the Chinese context. The ‘New War’ argument is a multi-faceted argument, and some of these facets fit in with the Chinese case. Image ID FNK63R © epa european pressphoto agency b.v. / Alamy Stock Photo. 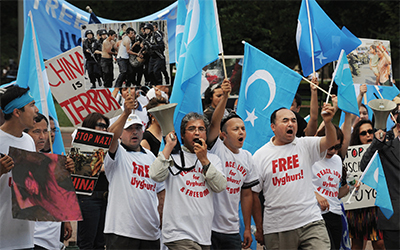 Protesters of the Islamic Uyghur ethnic group of China’s Xinjing Province demonstrate outside the White House as a Chinese delegation arrives to meet US President Barack Obama during the US-China Strategic and Economic Dialogue, 28 July 2009. Image ID DJ69BY © Pete Maclaine / Alamy Stock Photo. 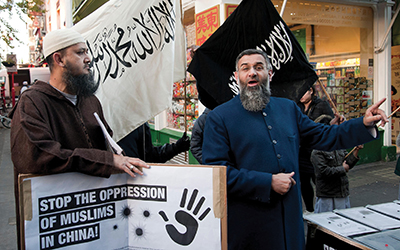 Anjem Choudary delivers a speech as Muslims and Islamists protest in London’s China Town, 22 November 2013. Another aspect of Kaldor’s thesis is that these ‘new’ conflicts need to be studied within the broader context of globalisation. Furthermore, boundaries between nation states are increasingly becoming blurred, and although conflicts in this day and age may seem to be localised, there may be strong transnational connections and a strong role played by external actors. Uyghur nationalism has been inspired by certain central Asians. The ETIM, in particular, is believed to have been inspired by the political Islam of the AF Pak region, and to some extent by Iran. Uyghur militants have been spotted in the AF-PAK region. In an era of globalisation, activists and insurgents also make use of technology. “International campaigns for Uyghur rights and possible independence have become increasingly vocal and well organised, especially on the internet.”20 Globalisation is affecting the development of Islam in China in a variety of ways. China is becoming part of the Islamic revival, which has become a global phenomenon over the last few decades. A certain kind of international Islam has become involved in strengthening Uyghur identity just as it has become enmeshed with ethno nationalist movements in various parts of the world. Dr. Stephen J. Blank, a Senior Fellow at the Strategic Studies Institute of the US Army War College writes, “…this increasing violence clearly stems from the globalisation of violence, including terrorism that pervades much of the Muslim world, and from the general growth in Xinjiang’s global links of all kinds.”21 It could be argued that some of the aspects of the ‘New War’ thesis intertwine with other aspects of the thesis. For instance, in this case, globalisation, which Kaldor mentions, intertwines with identity and identity politics, which Kaldor also discusses. Technology has been crucial in spreading awareness of the problem in Xinjiang. As a result of this awareness, Muslims from other parts of the Islamic world who feel strongly about their Islamic sense of collective identity, will come and join their Muslim Uyghur brothers to fight against Chinese oppression, or what is perceived as Chinese oppression. Globalisation has also increased the inequality of the Uyghur community and has therefore led to much polarisation within the Chinese context. The Hans have benefitted from the process in comparison to the Uyghurs. Growing inter-connectedness often creates new animosities and conflicts, which can, in turn, fuel reactionary politics and deep seated xenophobia, which we see in the context of Xinjiang. The region is also rich in natural resources, which the Chinese mainland would like to exploit in its quest to become a global super power. Kaldor discusses how these conflicts happen in a situation of erosion of state authority. This applies to Xinjiang, since the ETIM is essentially a secessionist movement. She is correct in suggesting that in these new conflicts, it has become increasingly hard to distinguish between the ‘external’ and the ‘internal.’ With regard to the Xinjiang conflict, this is very much the case. Although from the Uyghur standpoint, the Han Chinese presence in Xinjiang is viewed as external because the Uyghurs do not see themselves as a part of China, but rather, as a distinct nation in their own right. From an outsiders point of view, this distinction cannot always be made easily, since China sees Xinjiang as an ‘integral’ part of China, and has done everything it can to ‘sinify’ or ‘hanify’ the region, so that Xinjiang resembles China proper. Image ID FNF8PH © epa european pressphoto agency b.v. / Alamy Stock Photo. 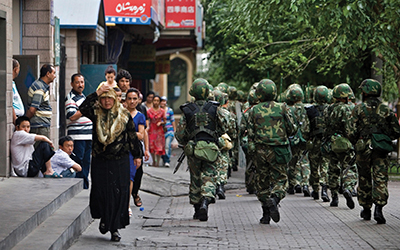 Chinese soldiers patrol the streets of a Uyghur neighbourhood after an incident between ethnic Uyghurs and Chinese security forces along the streets in Urumqi, Xinjiang Province, 13 July 2009. Xinjiang is also prone to human rights violations,23 which is also very much in keeping with the ‘New War’ thesis. 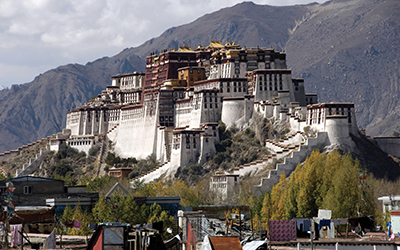 Image ID A1KGBM © Lou-Foto / Alamy Stock Photo.The Potala Palace in Lhasa, Tibet. The situation in Tibet is quite similar to the situation in Xinjiang. For starters, it is essentially a secessionist movement, and thus, happens in a context of China’s state authority being eroded. This is in keeping with the ‘New War’ thesis, since Kaldor mentions that ‘new wars’ end to take place in a context where state authority is increasingly being weakened. Image ID FKEHJX © epa european pressphoto agency b.v. / Alamy Stock Photo. 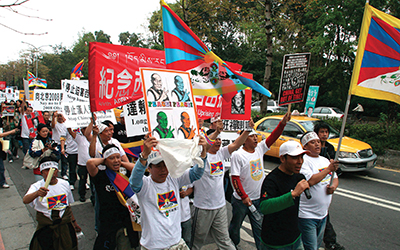 Hundreds of Tibetan exiles march through Taipei, Taiwan, 9 March 2008, to mark the 49th anniversary of Tibetans’ uprising against China’s invasion, and to demand independence for Tibet. Image ID BP661Y © Christopher Tozer / Alamy Stock Photo. 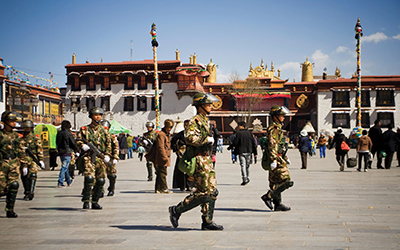 Chinese army soldiers patrol the Barkhor Square in front of Jokhang Temple in central Lhasa, Tibet. It could be argued that Kaldor’s ‘New War’ thesis still has considerable explanatory power. It travels far and wide, and although it was originally formulated in an East European context, and has been used as a theoretical framework to understand conflicts in the Middle East and Sub Saharan Africa, it can also be used to understand conflicts in contemporary China. Firstly, Kaldor’s argument that these wars happen when state authority is being eroded in an atmosphere of corruption and criminality apply to the Chinese context. 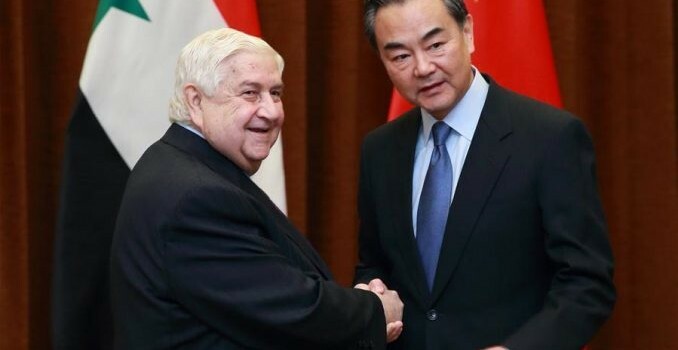 The very fact that both of these conflicts are essentially secessionist movements shows clearly that Chinese state authority is increasingly being undermined at the periphery, in its borderlands. Other aspects of the ‘New War’ thesis which can be found in the Chinese case include pronounced identity politics, the impact of globalisation, the heavy presence of the military and para-military, and human rights abuses. Sometimes, one aspect of the ‘New War’ thesis might intertwine with another aspect of the thesis. For instance in both cases, but more so with regard to Tibet, the heavy presence of the armed forces has paved the way for all manner of police brutality and human rights abuses to take place. Of course, there is an element of variation, and the thesis cannot be applied uniformly to both the case studies. The thesis seems to fit in better with the Xinjiang context than with Tibet. In other words, from the discussion above, we can find more of the features or aspects of the ‘New War’ thesis found in the context of Xinjiang than in Tibet. As a solution to the above conflicts, one needs to look at both the short term factors as well as the long term factors that have caused the conflict. Measures to prevent conflict can be divided into two categories: light prevention and deep prevention.40 The practitioners of ‘light prevention’ do not necessarily concern themselves with the root causes of the conflict, but their aim is to “…prevent latent or threshold conflicts from becoming severe armed conflicts.”41 Examples would include diplomatic interventions and private mediation efforts. Deep prevention, in contrast aims to address the root causes of the conflict which may mean engaging with issues of development, democracy and community relations. Since the conflicts in this article have been going on for decades and are still occurring in one form or another, it is important to give serious attention to deep prevention. If we take the light prevention approach, the problem will continue to persist. Since economic, political and social realities have led to these conflicts, sound policies in these areas can also provide a solution. The situation in both the case studies is not broken beyond repair. Good governance, effective development, reducing arms, demilitarisation, increasing human rights, and reducing the economic gap which exists between the different ethnic groups of these two provinces is most certainly the way forward.